The perfect blend of traditional and contemporary design influences, the Chartwell Wooden Stool Cream Fabric is the ideal accessory to any home, whatever your preferred interior style. Treat your bar area to the best with the Chartwell Wooden Stool. With its warm, cream fabric upholstery, its natural look enhances any colour palette, from the nicely neutral to the brilliantly bold. 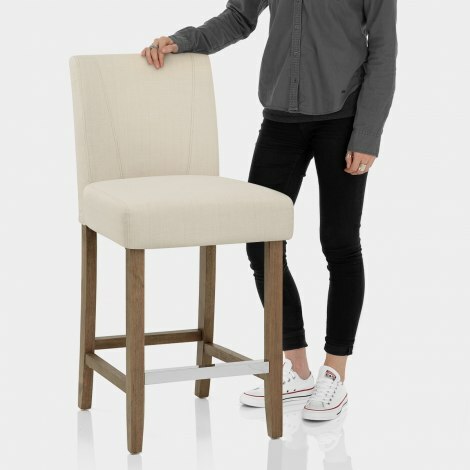 Simple and elegant, its tall, supportive backrest features two horizontal stitched lines for detail. 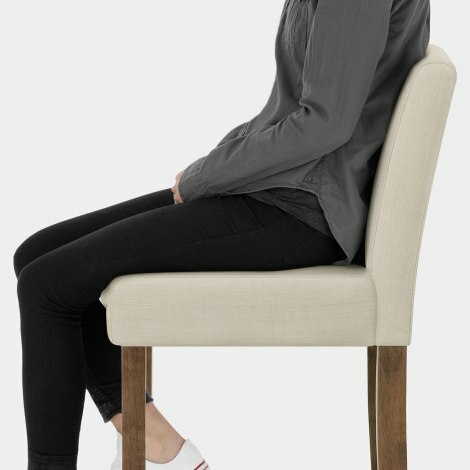 In line with time-honoured manufacturing techniques, the seat is supported by a sprung-and-belted frame, and topped with a super-comfy cushioning pad. Meanwhile, the supporting frame is formed of four strong legs, crafted from high-quality solid wood with an antiqued finish. For further reassurance, they are bolstered by horizontal bracing bars, which are contrasted by a polished chrome footrest. The Chartwell also features handy protective floor plugs, cementing its reputation as a perfectly practical, super stylish, bar stool.